Workflow steps are determined based on a team's size, structure and objectives. My projects usually start out as an item within a brain dump list. Once I've identified which projects I'd like to tackle, they move from the brain dump into the TO-DO phase. Identify projects within my bucket list that I'd like to tackle. Once these projects are identified I turn them into a kanban card and add them to the TO-DO phase. In the left-hand corner I write which week number I'd like to tackle this project for. If there is a due-date in mind I put that in the right-hand corner. Once I start working on a kanban card it moves to the PLAN state. The first step of this phase involves breaking down the project into action items and questions that need to be answered. Once action items are complete and questions are answered, the kanban card moves into the next state. Kanban cards in this state are near completion. The prototype has been tested, the consumer version is complete and needs to be photographed and prepped for release. Once a project has been released, the kanban card is moved into this state. Once this column is filled I discard of the sticky notes or move them to a new page to visualize how much has been done in a month/quarter/year. As you start using this methodology you might find that your workflow steps needs to be tweaked. I decided to use sticky notes for the headers on my kanban board so that I can easily change my workflow. I categorize the different spreads/layouts in my bullet journal into three categories: planning, static and dynamic (#dynamicbujo. 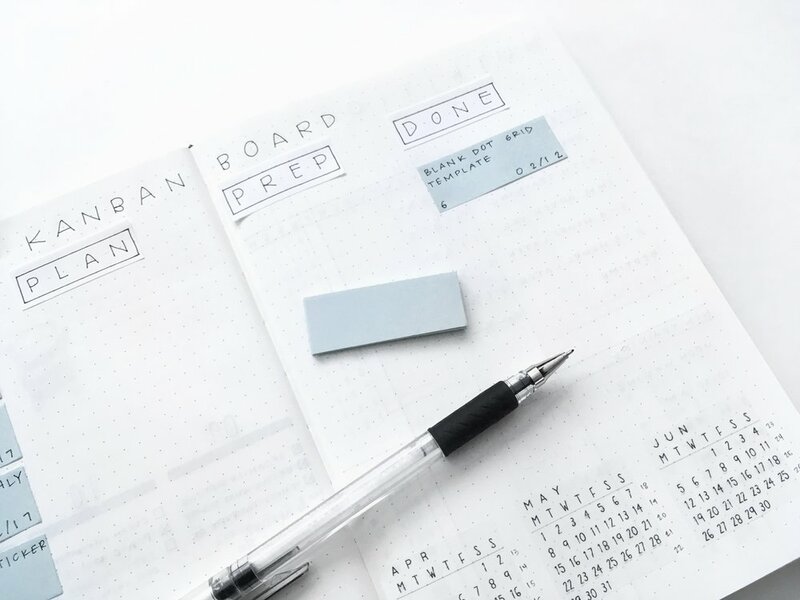 Planning spreads are the core spreads identified by the bullet journal system. These include but are not limited to: index, future log, monthly log, weekly logs and daily logs. These spreads dealing with how I plan for the far away and immediate future. Static spreads can be updated, but the bones of the page can't change. For example: gratitude logs, habit trackers, TV trackers and even Instagram trackers. You can update the tracker, but the structure and the layout of the page is static. Once you've completed your monthly gratitude tracker, you will need a new page to track next month's gratitude tracker. These types of trackers are essential for when you want to preserve the information that you've logged so that you can refer back to them at a later point. Dynamic spreads can be reused. I typically will write the purpose of the dynamic spread (the header/title) in permanent pen. This way the purpose of the page doesn't get lost. 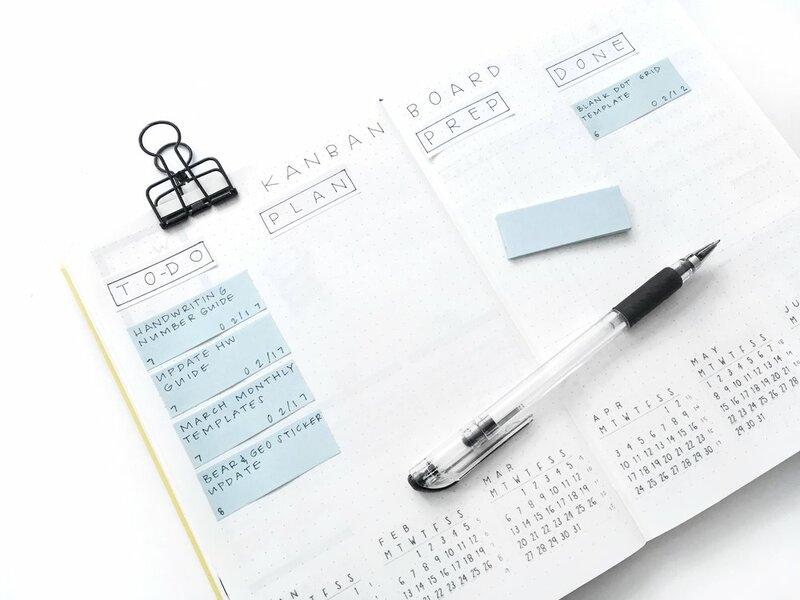 The kanban board is a perfect example of a dynamic spread. Even my workflow steps are sticky notes so that I can have the flexibility to change them as I learn more about what works for me. The kanban cards are also sticky notes so that they can easily be moved from one state to the next and then removed when they are done. New cards are easily added and the cycle repeats. I've included 6 months of calendars at the bottom of my kanban board. I add week numbers and possible due dates to each kanban card. I can easily scan the calendars to figure out how long a project is taking and how I should allocate my time on a project. Since this is a dynamic spread I can continue using this spread throughout the year. When June is over, I can switch out my repositionable calendars to the next 6 months. Repositionable calendars allow for maximum reuse of this page. And let's just say yay for recycling. These little calendars were bound for the trash bin since they were "oopsie prints" but instead I decided to keep them for my own journal! And that's how I use the kanban methodology within my bullet journal! If you try this out or have any questions shoot me a message! You can find me on Instagram @inkbyjeng.